A reliable source for Industrial Platforms information and a resource for accessing leading Industrial Platforms and suppliers. Industrial Platforms Industrial platforms are raised platforms used to help workers complete tasks and function more efficiently within their space. They do this a few different ways. First, they create additional working space in an industrial setting. Industrial platforms have many applications, including as: warehouse office space, storage space or manufacturing space. Industrial platforms may be freestanding or structural. Free-standing platforms are not attached permanently to the building. They work well because you can arrange them around equipment, machinery and workspaces. Also, when you are done with them or your application changes, you can move, adjust or disassemble them. Structural platforms, on the other hand, are actually built into the building structure via support beams, load bearing components are walls. They are less common because they cannot be quickly assembled and disassembled. They can, however, be installed with water pipes or electrical lines and are often stronger than their modular counterparts. Industrial Platforms - Abtech, Inc. Your manufacturer will work with you to help you decide what type of industrial platform is best for you. While they have many standard options, they can also custom design your platform. They offer many modifications like: open riser stairs, closed riser stairs, ladders, extra strong treading, railing, decking, emergency exits, landing/loading/unloading space for forklifts, observation decks, etc. Your manufacturer will take into account specifics like: your facility height, how much space you need below the platform, your intention for the extra space, the permanence of your application, your required weight capacity, your standard requirements (including OSHA and IBC), your timeline and your budget. 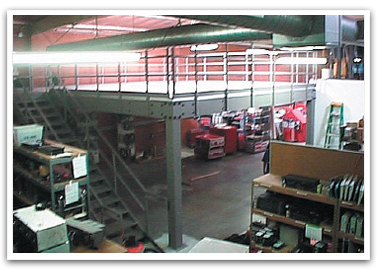 Learn more by discussing your application with the mezzanine manufacturers listed on this page. We can think of many reasons why industrial platforms are such a great investment. First, they increase efficiency. Not only do they create new workspaces, but they allow existing workspaces to become less cluttered and more organized. The more organized your workspace, the easier it is for you and your workers to be production. In addition, installing an industrial platform does not require anywhere near the same output of time, energy and funds that building a new wing or an extra facility would. Finally, because industrial platforms are not generally attached the foundation of your building, they are easy to adjust and relocate as needed.